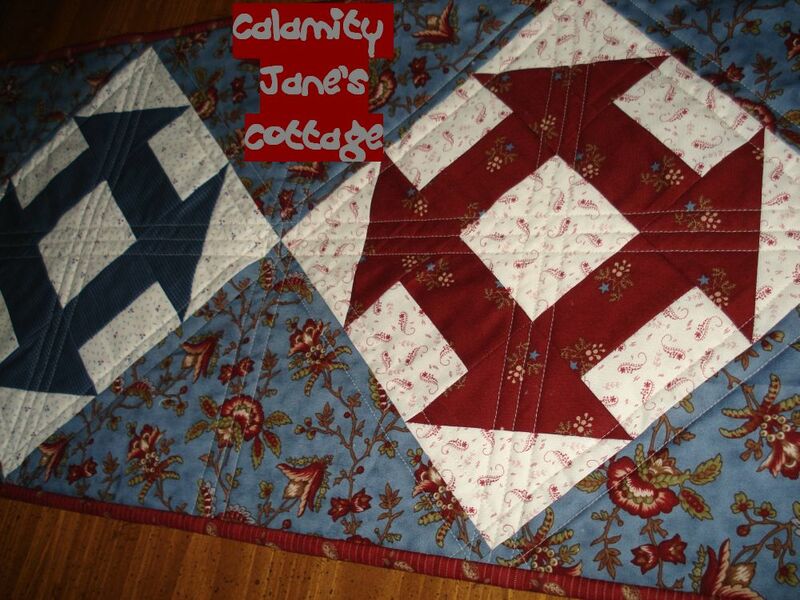 Calamity Jane's Cottage: Picture of giveaway, drawing tomorrow! It's gorgeous Bonnie! Yes, grandbabies come first! What a lovely table runner. Australia's equivelant to the Fourth of July is in January (Australia Day). It is the middle of summer then. Glad you had such a lovely time at the lake. The important stuff came first, as it should. Gorgeous quilt! 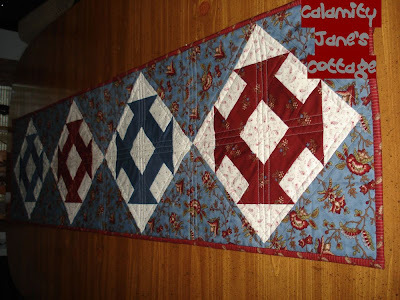 Understand the priorities - little quilting this weekend for me as visited my 5mo old grandniece overnight and then had garden produce to pick and "put up" when returned home. Wow! Your giveaway is beautiful and I do live in a country where red, white, and blue are the colors used to celebrate our Independence Day. Thanks for the opportunity to win. Absolutely love it! My Mom's birthday is the 4th of July.....the big 90!!!! A very large party in the works, then the next weekend another party at our place (on the farm) for the other half of the family. Right now waiting on granddaughter to give birth--would be the best gift ever if she turned 90 and had a great great granddaughter on the same day!!!! The table runner is wonderful. I'm glad you got to spend some time with your grandchildren. I'm impressed with all your canning! It's always better than the store. The table runner is beautiful! Glad for the opportunity to win it. Thanks! Oh wow, what a beaut of a runner love the colours and that blue fabric is to dir for - how can you part with it? Grandies are even more special than lovely quilts. Thanks for the chance to pop my name in the draw. Love the runner Bonnie. Someone will be very happy. That runner is so pretty Bonnie! Sure whoever wins it will adore it on their table for whatever season!! What a pretty table runner...red, white and blue is perfect for summer! What a pretty table runner. Thanks for hosting a giveaway. Enjoy your grandbabies- they grow up way too fast. Oh how pretty! I'm new here, I was searching for something else, but I bet I'll be back. Can I still put my name in for the giveaway?